Table 13.6, “Entry Rights” and Table 13.7, “Attribute Rights” show the access rights to entries and attributes, respectively, that are returned by a get effective rights search. An optional attributeList limits the get effective rights results to the specified attribute or object class. As with a regular ldapsearch, this can give specific attributes, like mail. If no attributes are listed, then every present attribute for the entry is returned. Using an asterisk (*) returns the rights for every possible attribute for the entry, both existing attribute and non-existent attributes. Using an plus sign (+) returns operational attributes for the entry. Examples for checking rights for specific attributes are given in Section 13.7.3.2, “Examples of Get Effective Rights Searches for Non-Existent Attributes” and Section 13.7.3.3, “Examples of Get Effective Rights Searches for Specific Attributes or Object Classes”. 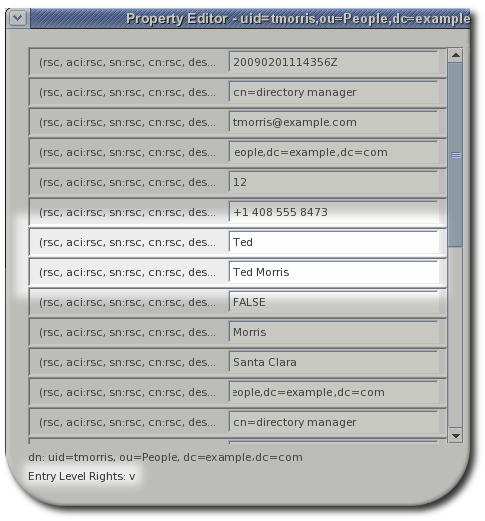 ldapsearch -x -p 389 -h server.example.com -D "uid=tmorris,ou=people,dc=example,dc=com" -w secret -b "uid=tmorris,ou=people,dc=example,dc=com" -E '!1.3.6.1.4.1.42.2.27.9.5.2=:dn:uid=tmorris,ou=people,dc=example,dc=com' "(objectClass=*)"
ldapsearch -p 389 -h server.example.com -D "uid=tmorris,ou=people,dc=example,dc=com" -w secret -b "uid=dmiller,ou=people,dc=example,dc=com" -E '!1.3.6.1.4.1.42.2.27.9.5.2=:dn:uid=tmorris,ou=people,dc=example,dc=com' "(objectClass=*)"
ldapsearch -p 389 -h server.example.com -D "cn=directory manager" -w secret -b "uid=tmorris,ou=people,dc=example,dc=com" -E '!1.3.6.1.4.1.42.2.27.9.5.2=:dn:uid=jsmith,ou=people,dc=example,dc=com' "(objectClass=*)"
ldapsearch -p 389 -h server.example.com -D "uid=dmiller,ou=people,dc=example,dc=com" -w secret -b "uid=tmorris,ou=people,dc=example,dc=com" -E '!1.3.6.1.4.1.42.2.27.9.5.2=:dn:uid=tmorris,ou=people,dc=example,dc=com' "(objectClass=*)"
However, a regular user can run a get effective rights search to see what rights another user has to his personal entry. In Example 13.4, “Checking the Rights Someone Else Has to a Personal Entry”, Ted Morris checks what rights Dave Miller has on Ted Morris's entry. ldapsearch -p 389 -h server.example.com -D "uid=tmorris,ou=people,dc=example,dc=com" -w secret -b "uid=tmorris,ou=people,dc=example,dc=com" -E '!1.3.6.1.4.1.42.2.27.9.5.2=:dn:uid=dmiller,ou=people,dc=example,dc=com' "(objectClass=*)"
ldapsearch -D "cn=directory manager" -w secret -b "uid=scarter,ou=people,dc=example,dc=com" -E '!1.3.6.1.4.1.42.2.27.9.5.2=:dn:uid=scarter,ou=people,dc=example,dc=com' "(objectclass=*)" "*"
One of the options listed in the formatting example in Section 13.7.2, “The Format of a Get Effective Rights Search” is attributeList. To return the effective rights for only specific attributes, list the attributes, separated by spaces, at the end of the search command. 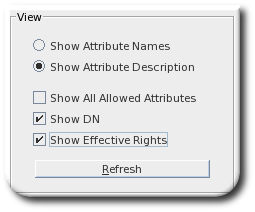 It is possible to specify a non-existent attribute in the attributeList, as with the initials attribute in Example 13.6, “Get Effective Rights Results for Specific Attributes”, to see the rights which are available, similar to using an asterisk to list all attributes. ldapsearch -D "cn=directory manager" -w secret -x -b "uid=scarter,ou=people,dc=example,dc=com" -E '!1.3.6.1.4.1.42.2.27.9.5.2=:dn:uid=scarter,ou=people,dc=example,dc=com' "(objectclass=*)" "+"
ldapsearch -D "cn=directory manager" -w secret -b "dc=example,dc=com" -E '!1.3.6.1.4.1.42.2.27.9.5.2=:dn:uid=scarter,ou=people,dc=example,dc=com' "(objectclass=*)" "*@person"
$ ldapsearch -D "uid=scarter,ou=people,dc=example,dc=com" -w secret -b "dc=example,dc=com" -E '!1.3.6.1.4.1.42.2.27.9.5.2=:dn:uid=scarter,ou=people,dc=example,dc=com' "(objectclass=*)" "*@person"
If the criticality is not set for a get effective rights search and an error occurs, the regular entry information is returned, but, in place of rights for entryLevelRights and attributeLevelRights, an error code is returned. This code can give information on the configuration of the entry that was queried. Table 13.8, “Returned Result Codes” summarizes the error codes and the potential configuration information they can relay.